Atlanta’s supreme event, Shaky Beats Music Festival has announced its lineup by day. 1-Day General Admission, 1-Day GA+, and 1-Day VIP tickets will go on sale tomorrow, February 13th at 10 AM. 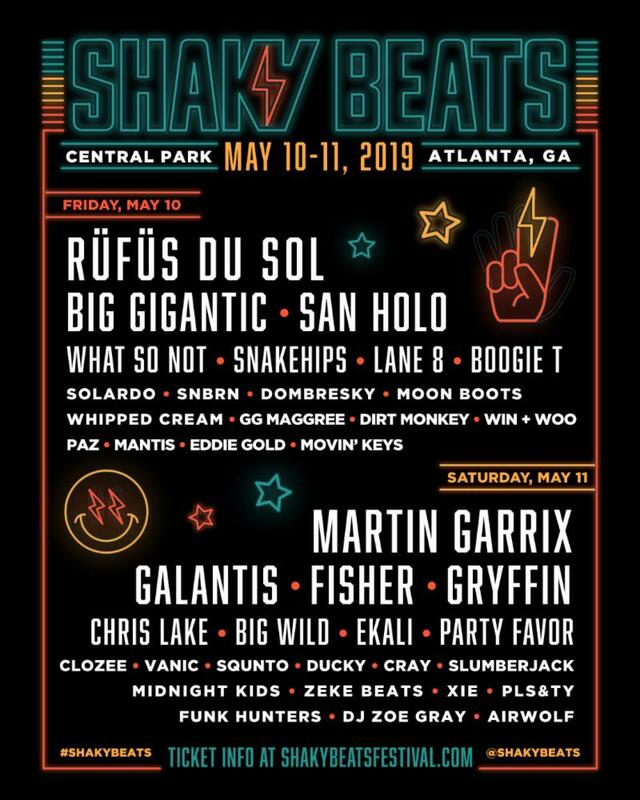 The fourth annual Shaky Beats will deliver 40 artists across 4 stages over a two-day span at Central Park in downtown Atlanta, taking place on May 10th and May 11th. Friday performers include RÜFÜS DU SOL, Big Gigantic and San Holo and on Saturday, Martin Garrix, newly added Galantis, Fisher and Gryffin will close out the festival. 2-Day General Admission, 2-Day GA+ and 2-Day VIP tickets are still available. GA+ includes access to a private lounge with shaded seating, premium sight-lines of the main stage with a dedicated viewing platform, air-conditioned restrooms, and a dedicated full-service cash bar. VIP Tickets include dedicated express entry lanes, prime viewing areas at three stages, and a viewing platform with elevated sight-lines of the main stage and second stage. VIP Tickets also include access to the air-conditioned VIP Lounge, featuring shaded seating, premium restrooms, complimentary bites, and full-service cash bars with complimentary beer and water. Shaky Beats Music Festival is for ages 18+. Shaky Beats fans can sign up for the E-List to be the first to receive new information and follow social media to stay in the know for all festival announcements.